Vermont’s population is 608,827, according to the 2000 census. The ten largest cities and their populations are… Burlington, 38,889, Essex, 18,626 Rutland, 17,292, Colchester, 16,986, South Burlington, 15,814, Bennington, 15,737,Brattleboro, 12,005, Hartford, 10.367, Milton, 9,479 and Barre, 9,291. 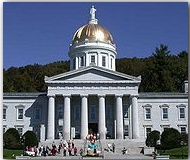 Montpelier is the capital and Burlington is the largest city. Vermont is bordered by New Hampshire, across the Connecticut R. to the east, Massachusetts to the south, New York, with Lake Champlain forming almost half the border to the west, and the Canadian province of Quebec to the north. Vermont covers 9,250 sq miles. The forested Green Mts. constitute the dominant physiographic feature of Vermont. Vermont has short summers and a humid, continental climate, with abundant rainfall. Winter brings heavy snows, which usually cover the ground for at least three months. Summer brings thousands of visitors drawn by the scenic mountains and the picturesque New England villages. In the winter thousands of skiers flock to the slopes at Mad River Glen, Bromley, Stowe, Stratton, and elsewhere.